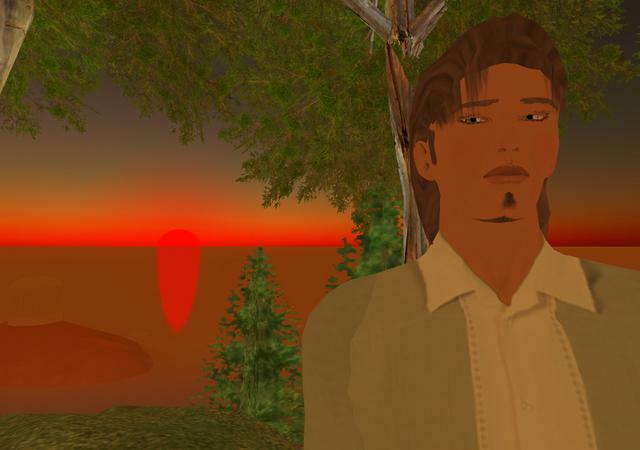 Over the next three days, I'll be present some case studies of Second Life as an educational tool, based on interviews I've conducted for New World Notes. These are intended to supplement the talk I'll be giving today at The Education Arcade in Los Angeles. Matt Farber is a graduate student at a major Southwestern university. The class he refers to employs Second Life as a teaching tool. My only [prior] experience with video games are car and motorcycle race games. My undergrad was in business, but I am now getting my graduate degree in architecture. The class was entitled Designing Digital Communities. [This] class counts as a planning course for me. I have to admit, I did not spend much time in here building stuff, which is what you would probably think is natural for an architect… [F]or me, it was more about allowing the bigger community the chance to access this space. I thought this would be a great environment for everyone to enjoy, and that it would be a good social place for people who don't often get out much… [So] I guess my project was maybe more focused on what the [digital] community could be used for. I have worked with some Special Olympic kids, before I went back to school, and I thought it would be great if I could have some meaningful interactions with them, without actually being there. I tried to introduce some members of the disabled community to Second Life. I visited some of the local special education students, and worked with them individually. One girl had cerebral palsy; she was in a wheelchair. She had a helper who did the keyboard stuff for her. She had a good time. Some guy was hitting on her when she was in world. I think she was flattered. It was probably neat for her to be considered "normal", at least for a little while. I also worked with a guy who was autistic. But [he] was really not very social. He was sort of frantic and wanted to explore everything. So he ended up looking around for about 90 minutes, it was crazy… I think Second Life for him was a giant treasure chest, just waiting for him to explore. He had done these incredible drawings on a chalkboard, the day before I got there, of various city skylines. I think he is interested in 3D spaces, so SL was a playground for him. They were interested in the communication aspect of what this environment offered. The students are only allowed to stay in public education until they are 22, and then they are on their own. So they thought that maybe this place would allow them to stay in touch with them (the teachers) as well as their classmates…. They teach life skills as well as vocations, so I think Second Life has a lot to offer. I think that Second Life can become whatever it needs to be for a particular person. I was a bit unsure about SL and what the purpose of such a place could be. But after working with these students I began to realize that I was using SL in my own way. I don't think I am making too much sense, but… seeing these students interact in their own way made me realize that SL could adapt to many different possibilities.